India is importing less pharmaceutical raw materials from China, but the Chinese challenge is far from over. On January 29, 2016, the Narendra Modi government decided to withdraw the customs duty exemption on import of 73 bulk drugs. It was a tough call as import of these low-cost key active pharmaceutical ingredients (APIs), or raw materials - almost entirely from China - was helping Indian formulation companies, or entities that make syrups, tablets, injections, etc, remain competitive. An increase in medicine prices due to rise in input costs would have been unpopular as imports included raw materials used to make life-saving medicines for critical illnesses such as cancer and HIV/AIDS. But the government bit the bullet because of a bigger threat. The import of low-cost bulk drugs from China, which touched almost $2 billion in 2014/15, was severely impacting domestic bulk drug production. India had become too dependent on raw materials from China for making several life-saving drugs and there were apprehensions that any abrupt end to this flow could trigger a public health crisis, as the domestic industry didn't have the capacity to fill the gap. The fact that bulk drug and other key drug intermediate imports from China touched a record $2.14 billion in 2015/16, justified the fear. Two years later, the government has a reason to rejoice, as the value of drug imports from China dropped one-third to $1.41 billion in 2016/17. The escalation in retail prices has not been steep. And there are signs of revival of bulk drug manufacturing hubs in states such as Gujarat and Telangana. Has this been possible because of the withdrawal of the customs duty exemption? And, is there a visible change in the drug industry's dependence on China? It is too early to say. The value of drug raw material imports from China might have come down, but its share in volume terms is still significant. Global healthcare information provider IMS Health, in a recent report, which was commissioned by the Department of Commerce in coordination with the Indian embassy in Beijing, said 90 per cent fermentation-based products such as 6-Aminopenicillanic acid (6-APA) and its predecessor, Penicillin-G (Pen-G), the key ingredients in semi-synthetic penicillins (SSPs) in India, are imported from China. The report says that to make a difference, India needs to ramp up the manufacturing of bulk drugs and intermediates of commonly prescribed Vitamin C and antibiotics like Metronidazole, Ofloxacin and Livofloxacin to offset the high (60-70 per cent) dependence on Chinese raw materials. The report also says that China accounts for 51 per cent of India's medicine raw material imports by value and 80 per cent by volume, an indication of its heavy dependence on China for manufacturing high-volume/mature products. Have Indian companies lost the ability to make such high-volume products? Not really. It seems the reason for such high imports is more economical than technical. "India manufactures most of the bulk drugs that are imported from China," says Niranjan Singh, a Vadodara-based consultant, who helps Chinese pharmaceutical companies get their products registered in India. Singh, who has over 80 Chinese clients and has been instrumental in registration of about 150 products in India in the last decade or so, says India's bulk drug requirement can be categorised into three segments. "One, getting APIs (bulk drugs) from China to make formulations to sell in the US and other regulated markets. Two, import of raw materials to make products to sell in India. And three, using these to make products for the rest of the world. While there is minimal use of Chinese raw materials in products made for the tightly-regulated markets (US, Europe, Australia, etc. ), in other segments, it is very big," he says. The withdrawal of the customs duty exemption has reduced some price arbitrage importers had, but that is not the only reason India's bulk drug industry has started seeing an opportunity. In China, the cost of producing bulk drugs has shot up in the last two years and pollution control measures are driving several units to close down. Some are reducing production, while others are relocating to dedicated chemical zones. Labour charges are also not low any longer. All this has made China's products expensive. "It is a blessing in disguise. We had a price difference of 20 per cent-plus. Prices have increased to a level that has given Indian manufacturers cushion to re-start production. In the last five-six months, bulk drug capacity addition in states such as Gujarat has been rising," says P.V. Appaji, former director general of Pharmaceutical Export Promotion Council. Just before the government decided to withdraw the customs duty exemption, it declared 2015 as the year of API and asked a committee headed by V.M. Katoch, the then secretary, Ministry of Health, to suggest a long-term strategy for boosting bulk drug production. None of the suggestions has been accepted. "The recommendations are pending. Unless a Budget allocation is made (to promote the industry), nothing is going to move," says B.R. Sikri, Vice President, Bulk Drug Manufacturers of India. Sikri is worried that the conditions created by external factors may not sustain the industry's growth unless the government decides to ride the momentum and improve infrastructure. "The Katoch Committee has recommended the creation of large pharmaceutical clusters to gain from economies of scale like China does. It talks about providing common infrastructure such as utilities and effluents treatment facilities on a par with the best in the world through government funding. It has even suggested that the government set up plants for critical APIs and intermediates that cannot be supplied by private players due to commercial non-viability," says Sikri. The industry wish list includes flexible and simple environmental laws and policies, faster approvals and anti-dumping duty on products that are in abundance in India. Should the government take the Katoch Committee recommendations seriously? Or is there no reason to worry as it is the end of China's low-cost production story? Niranjan Singh believes that the lull is temporary and the next Chinese onslaught is not going to be in the form of low-cost raw materials. 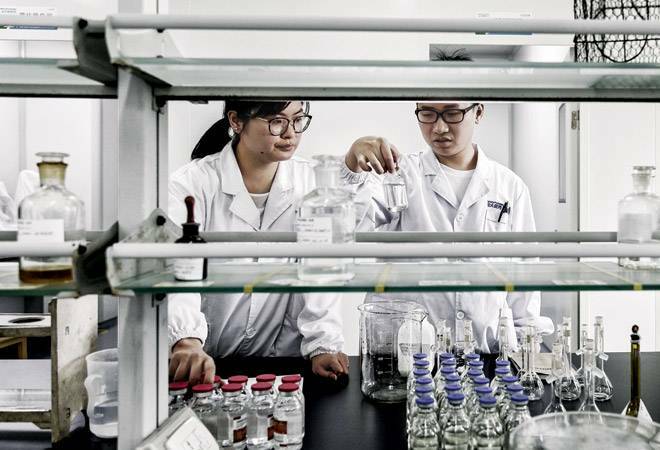 "Since 2007, China has been concentrating on improving its formulation manufacturing capabilities. It is slowly switching to formulations and is going to pose as a big challenge there," he says. Given China's ability to create global scale capacities, the day when "Made in China" quality medicines start arriving in tablets and capsules may not be far away. It is high time the government and the domestic industry put their act together.